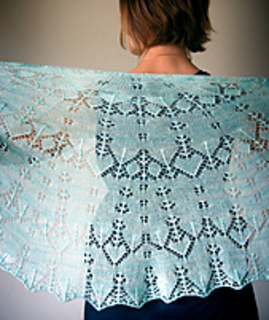 A lightweight semicircular shawl worked from the top down. 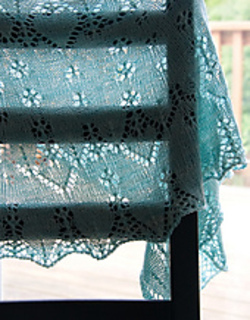 It’s airy and lacy, but there are lots of plain knitting rows, making this a good project for the ambitious beginner-lace knitter, or for the experienced lace knitter looking for a relaxing project. Finished dimensions about 54 inches/137 cm wide by 27 inches/68.5 cm deep. Pattern includes both chart and large-print written instructions for the chart. I’ve kept the construction as simple as possible to make this accessible to different experience levels. 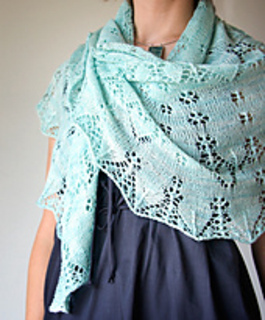 The edge is a simple garter stitch, and the border ends with an easy stretchy bind off. You could of course, modify the construction with more elaborate edging and a knitted-on border. I have posted instructions for the Garter stitch tab on my site. Thank you isa1950, pagebooks, momone92, catpurloo, SAD, yadvi for your cheerful feedback and hard work.